Back in Action are pleased to reveal our exclusive collection of our favourite Varier chairs, all upholstered in Paul Smith Fabric. Paul Smith is a leading English fashion and fabric designer - Varier is a leading Norwegian Furniture manufacturer; We think that in combination, our favourite chairs look even better in this beautiful fabric. Our photographs are optimised to highlight this wonderful fabric. All these chairs are available in Natural Beech, and Black Stain. This offers almost perfect design and function. Only the Thatsit exceeds the Variables qualities, but the Variable wins on price so it's our best selling kneeling chair. The Variable can fit people from 5' 2" to 6' tall. People below 5' 2" will need to order Variable Blocks. People above 6" should use the Thatsit. 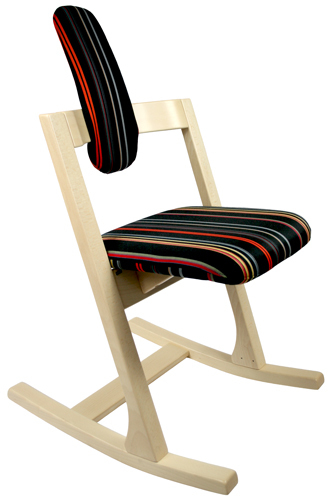 Varier's famous Variable Kneeling Chair available in a limited edition Paul Smith fabric. A multi purpose stool that lets the body move fully through 360 degrees. Perfect as a standing support. Easy to use and light enough to move around with you. The disc base is graded, giving Move a tilting angle to follow your body's differing positions. The disc base is equipped with a rubber surface to ensure friction and to protect the floor. Freedom of movement is important to us all and Move could be the most movable experience you'll ever have! 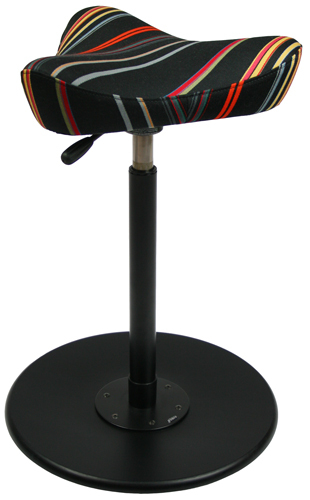 Varier's famous Move stool in exclusive Paul Smith fabric. The Move II features a small Move seat with a normal Move plate and medium gas-lift. The Pendulum and the Actulum are two chairs with a slightly different appearance and action.Both chairs are made to fit tables up to 75-cm height. The runners make it possible to change position comfortably. The overall design and functionality makes the chair suitable for either a work or study environment. In Back in Action stores most people choose the actulum despite its higher price. When tilted forward, the seat angle encourages a naturally wide angle between the thigh and torso. This makes breathing easier and provides well-being whilst seated. 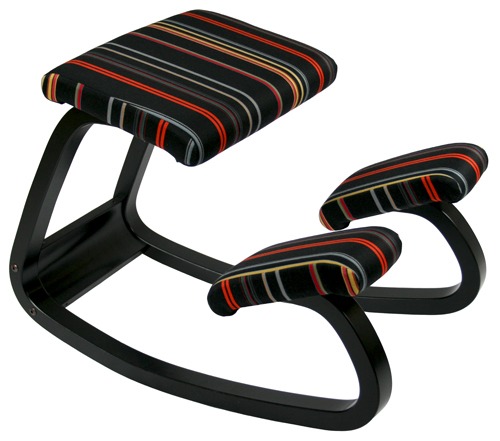 Varier's famous Pendulum chair in exclusive Paul Smith Fabric.